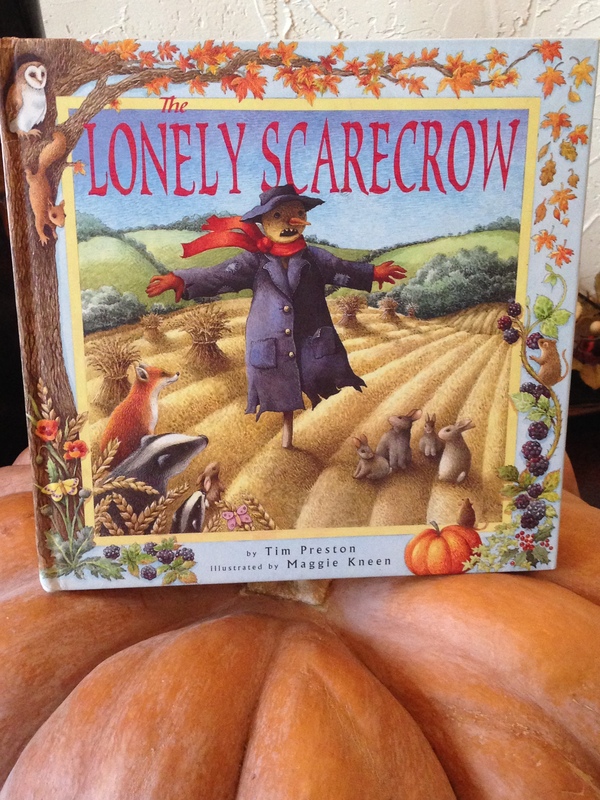 The Lonely Scarecrow has kept us company for three years as we discovered this book when my older son was in Kindergarten. 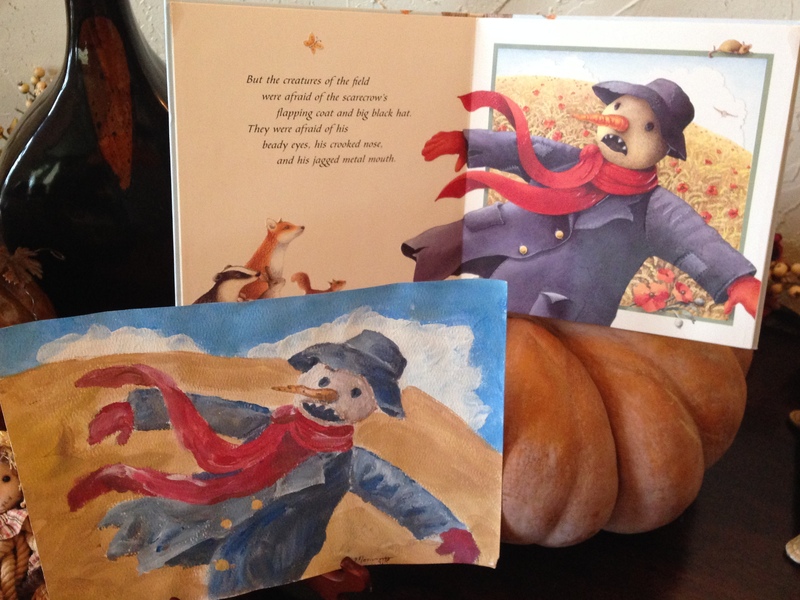 We read it over and over again, intrigued by seeing the world from a scarecrow’s point of view, engaged by touching the beautifully embossed pictures and entertained by trying to paint our own rendition of the scarecrow. 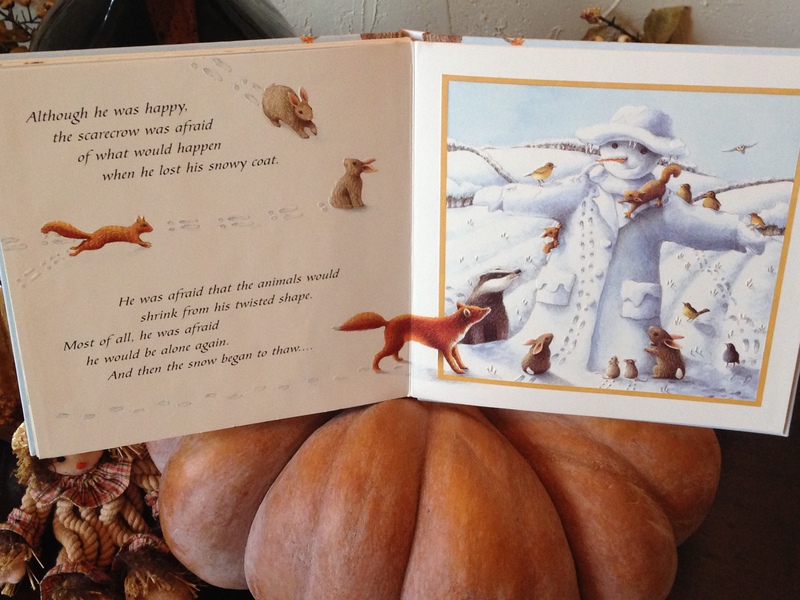 Each year we look forward to fall, partly for putting this book in a special place among our autumn décor where we can pick it up to read often. We’ve introduced this scarecrow to many friends and now it’s your turn to meet him! He had a scary face but a kindly heart. The animals feared the scary scarecrow. As seasons passed and the animals played, always keeping their distance from him, he grew lonelier. The wheat soon grew taller than his view, and he lost sight of ever making friends. When the combine monster came to harvest the wheat, the scarecrow stood in an empty field while the animals hid. The first snow of winter soon fell and the animals came to play on the frozen earth. seemed to have vanished, too. The animals played around and all over the happy scarecrow. He was no longer lonely, but he was afraid. He was afraid that when he lost his snowy coat, the animals would no longer be his friends. But as the snow melted, the animals looked up in wonder at him. scary creature they had feared for so long? The birds, mice, rabbits, fox, raccoons and squirrels nestled in close on his long arms, black hat, and in the pockets of his ragged, blue coat. And the scarecrow knew that he would never be lonely again. The beautiful, poetic words of this story along with the endearing, embossed pictures make us readers come ironically close to the scarecrow. And somehow by the end of the book, any loneliness lingering in our hearts seems lessened by the warmth and hope of friendships that can surround our lives when people see a kindly heart in us. F- What are some things (like appearance or personality traits) that make you feel afraid to be friends with someone? Talk about ways to see beyond these hindrances and reach out. R- We all can relate to the scarecrow’s feeling of loneliness in some way. Describe a time when you were lonely and what you did to be friendly and how others reached out to you. I- Imagine that you can be any of the animals in this story. Which one would you want to be and why? E- Explore the process of the wheat harvest from seed to plant to product. Create a timeline with pictures showing the process. 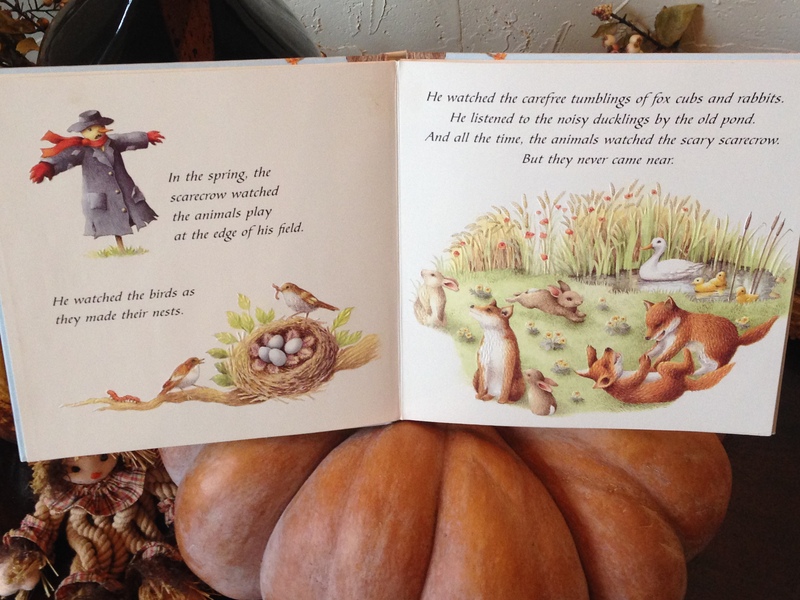 N- Navigate your way through the seasons from the view point of your favorite animal from this story. Take your paper and fold it in half twice, creating four squares. 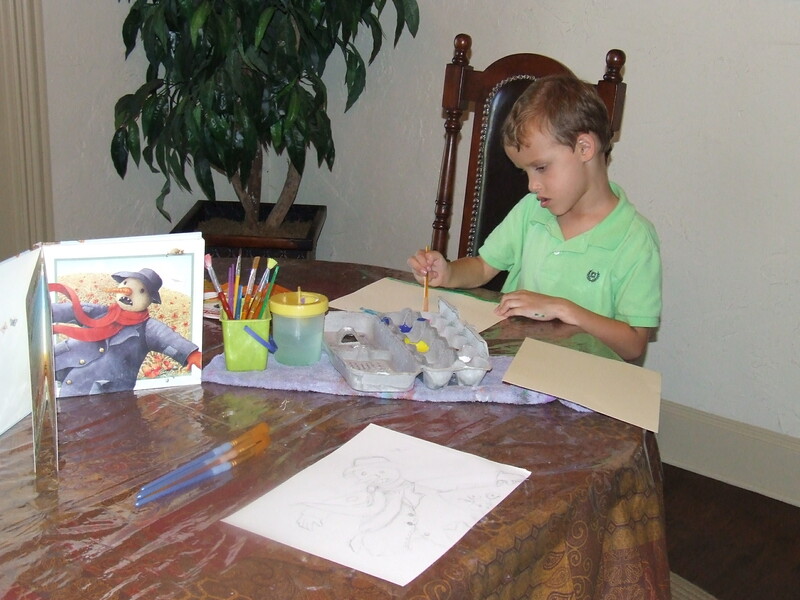 Then sketch and color what the animal does in each season. Include pictures of its food, home, growth and more. S- Share your favorite illustration from the book. My favorite part is the animal’s footprints up the scarecrow’s snowy coat. The little bird footprints are precious. 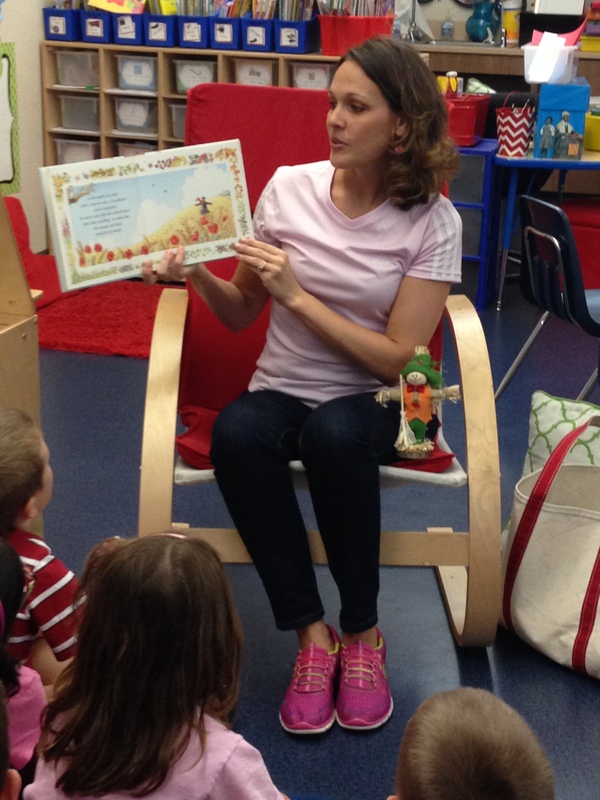 Thankful to introduce The Lonely Scarecrow to our daughter’s 1st grade friends. My rendition of the scarecrow (3 years ago) while creating memories with our older son. and therefore featured as a centerpiece in our home décor. 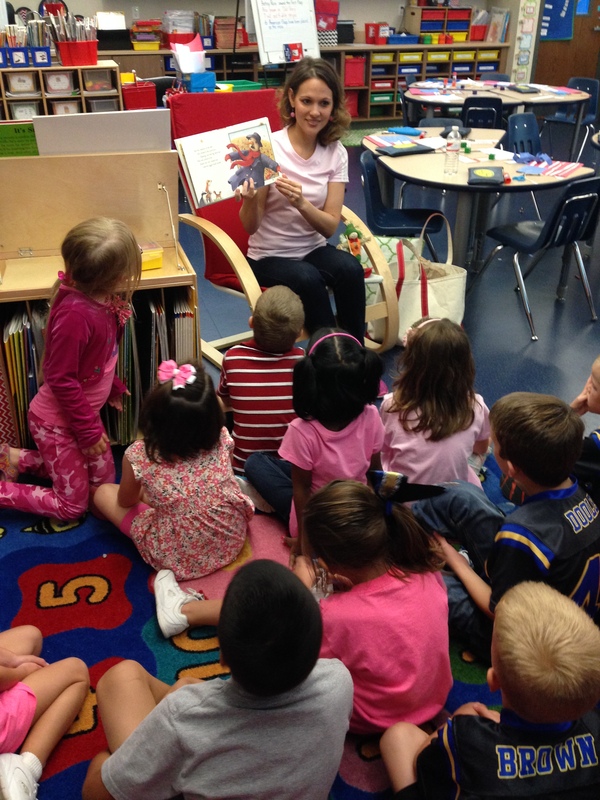 *Please take a minute to “Like” Kidsbook Friends on Facebook and subscribe to the blog via e-mail at http://www.kidsbookfriends.com. Looking forward to connecting with you! 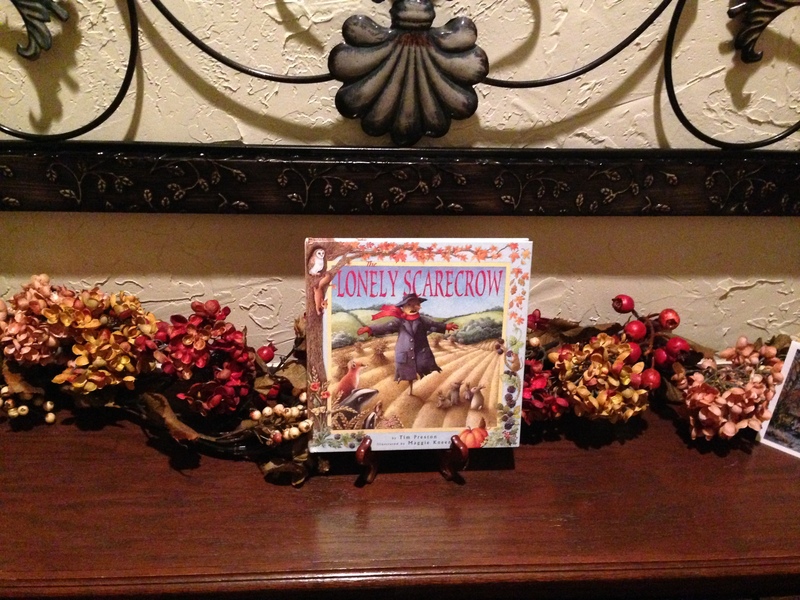 This entry was posted in fall, Friendship, garden, winter and tagged children's books for fall, Dutton Children's Books, friendship, harvest, loneliness, Maggie Keen, scarecrows, snowmen, The Lonely Scarecrow, Tim Preston. Bookmark the permalink.